Green-yellow color. Less bitter and spicy than most olive oils, mild to strong fruity flavor. Best for cooking, frying, pastries, fresh salads. Our Olives are carefully harvested assuring minimum damage to the fruit. They are selected by hand in order to avoid foreign particles from being crushed along with them. Our oil is cold extracted and only by mechanical means at a low temperature, preserving the proportion of essential fatty acids, vitamin E and natural Antioxidants. This way the consumers get only the best quality out of the olive juice. It is 100% natural and keeps all of its nutrients. 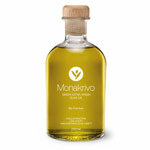 Our oil is of premium quality and low on acids. Euphoria came to life in 2013. After several years of oil production for personal use, the time has come to let the world know about our premium quality olive oil. Euphoria is a small business run mostly by its founder. This way we are sure about every step of our processes thus assuring that consumers get only the finest quality. Olives in Jar and Olive Paste.